Listed as missing in action on 22nd February 1945 piloted by 1Lt Frederick Ross and claimed by Oblt Hans Dortenmann, 11./JG54. 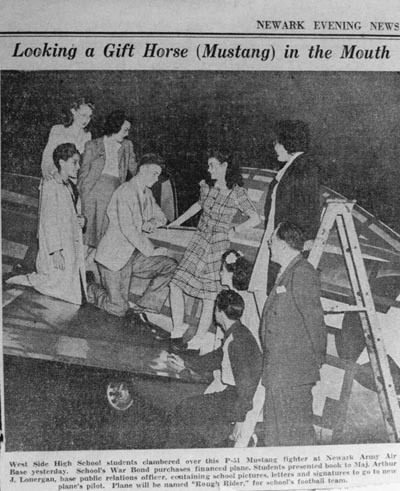 According to Elmer Fiery, assigned to the plane in the 364th Fighter Group, this Mustang was actually a replacement for a P51 purchased with War Bonds by students of the West Side High School in Newark, NJ. 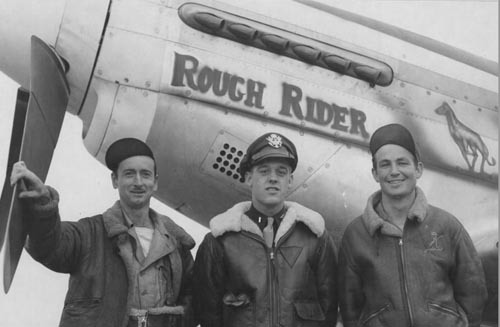 The original "Rough Rider" was given much publicity at its naming ceremony and was deployed to the group, prepared for combat and promptly lost. In view of the publicity and in order to maintain morale, this replacement was immediately named with the same title and given to a pilot who came from Newark, i.e. Elmer Fiery. An enlisted man spray painted the rearing horse and painted the title. Elmer Fiery flew 20 missions in the plane before completing his tour of combat and passing the Mustang on to other pilots.